The Kantele Shop sponsors and/or provides different types of workshops, including learning to play kantele and learning to make kanteles. 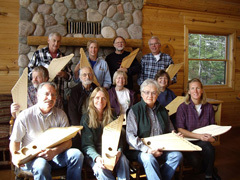 One workshop for building and playing kanteles was held in the autumn of 2010 near Ely, Minnesota. An Endorsement Of A Kantele Shop Instrument "One of my best purchases in life"
Video of Gerry Henkel Playing "Music For A Straw Hat"
The Kantele Shop - where even a bull can make music. Click on photo above for a QuickTime movie. Meet El Torokantele.